This summer has seen a great number of extraordinary events resulting from human caused climate change. These include massive heat dome high pressure systems setting off record droughts, fires and heat waves, Arctic temperatures rocketing into the 80s and 90s, Europe and Canada suffering some of their worst flooding events in history and a crazy US weather system moving backwards against the prevailing weather pattern for more than 3,000 miles. Add to these record events a substantial melting of ice in the Arctic’s most central regions, and you end up with rather strong proofs that our greenhouse gas emissions have permanently altered the word’s weather. From late May to early July, a persistent Arctic cylone (PAC 2013) first fractured ice near the North Pole, then consistently widened and melted the gap it created. 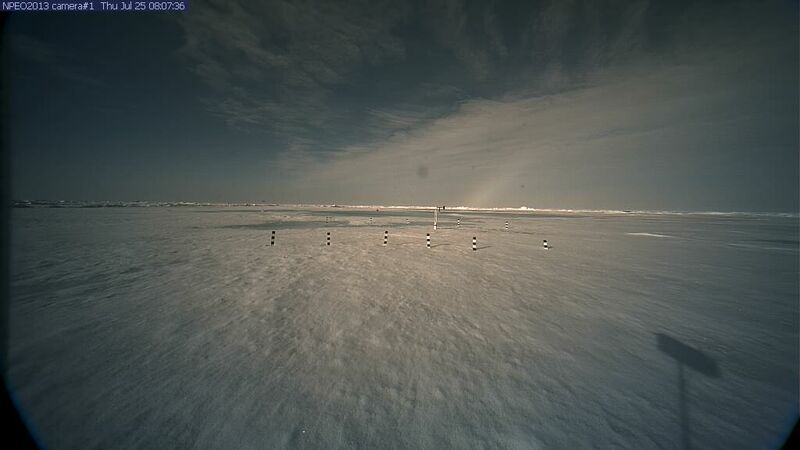 Now a large triangle of very thin ice extends from the North Pole south and eastward toward the Laptev Sea. The section of meter or less thickness keeps widening even as gaps continue opening in the ice and melt ponds form over many of the remaining flows. 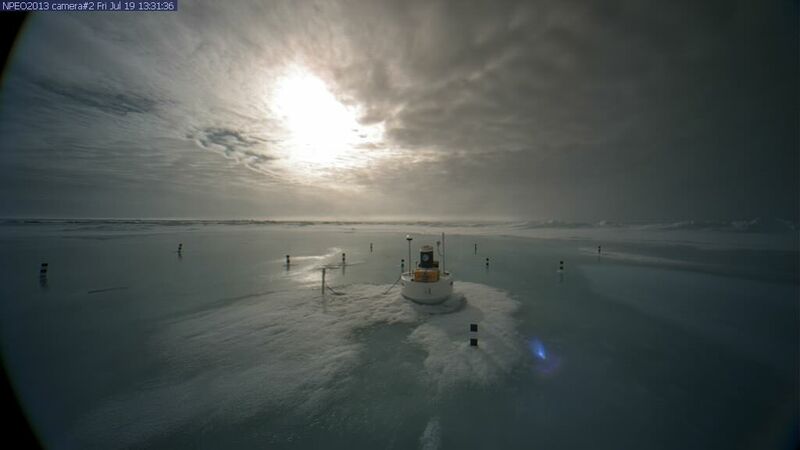 Further north and on toward the western side of the North Pole, two cameras supplied by the Applied Physics Lab and funded through a National Science Foundation grant are performing their own daily recording if this major melt event. 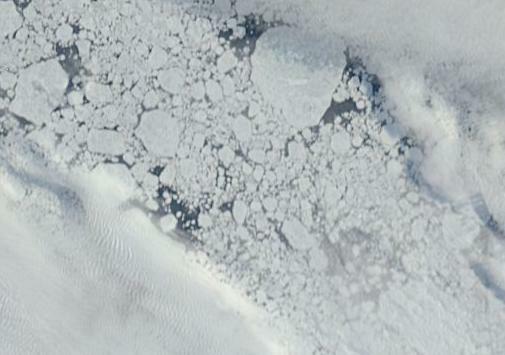 The melting, which from the satellite, appears to have turned the sea ice near the North Pole into swiss cheese has had a marked effect on visible surface conditions as well. Of the two ice cameras, #2 so far has seen the most action. On about July 13th, melt puddles began to form in the region of Camera #2. 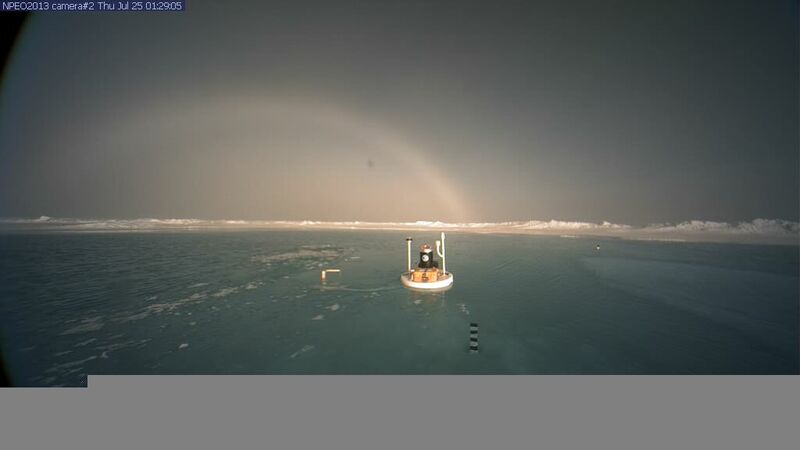 By earlier this week, the camera was deep in a growing pool of ice melt. 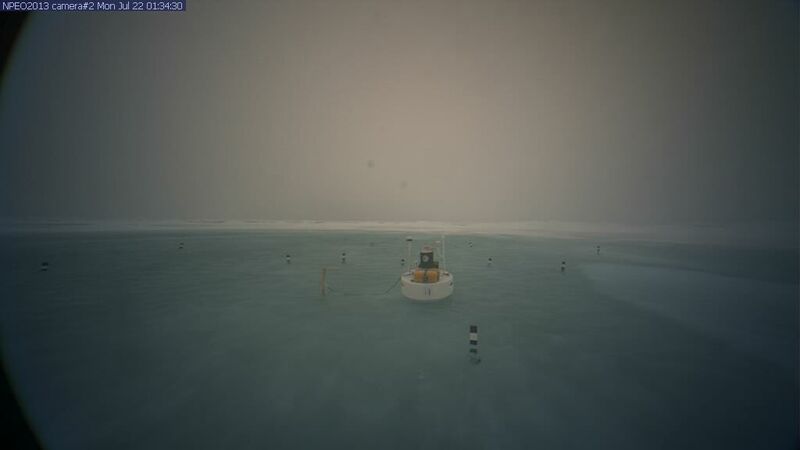 By today, the water had deepened further covering all the markers surrounding both the camera and its related sensor buoy. Water now appears to be about 3 feet deep and the pond just keeps growing and growing (you can read more about the saga of Ice Camera #2 here). Note the melt puddle snaking its way behind the wind vane visible in the camera’s field of view and on toward Camera #1 itself. 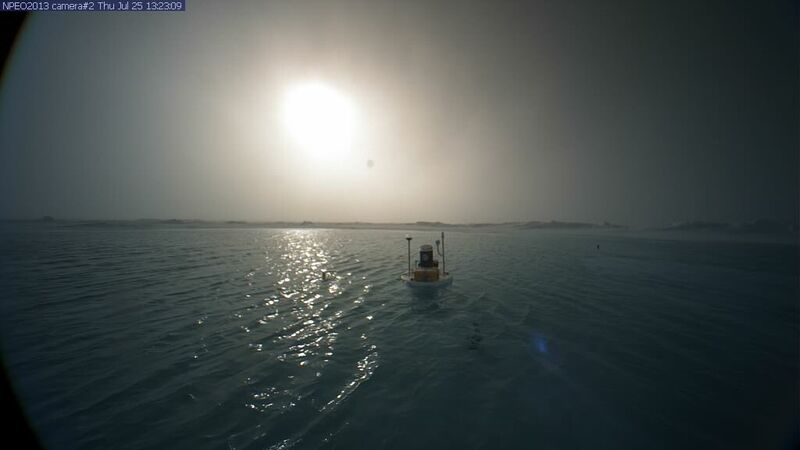 If conditions at this camera are similar to those near Camera #2, then we can expect Carema #1 to be swimming in about ten days time. With temperatures remaining above freezing for much of the Central Arctic, melt conditions have tended to dominate. 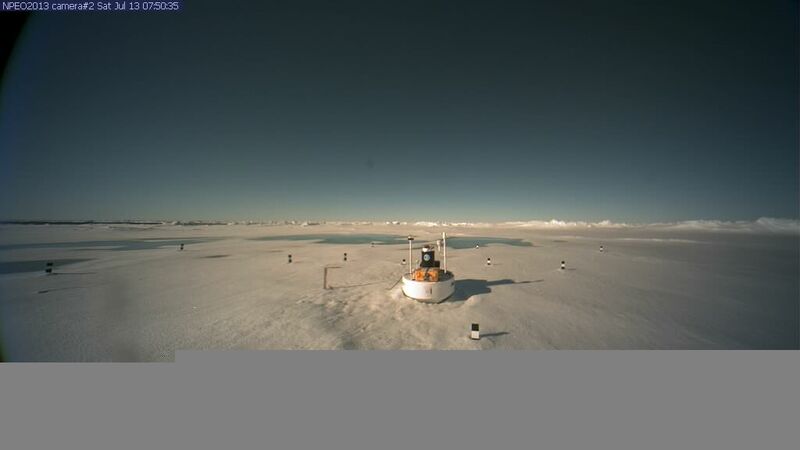 Now, most of the remaining ice is rather weak, with a thickness of about 2 meters or less. 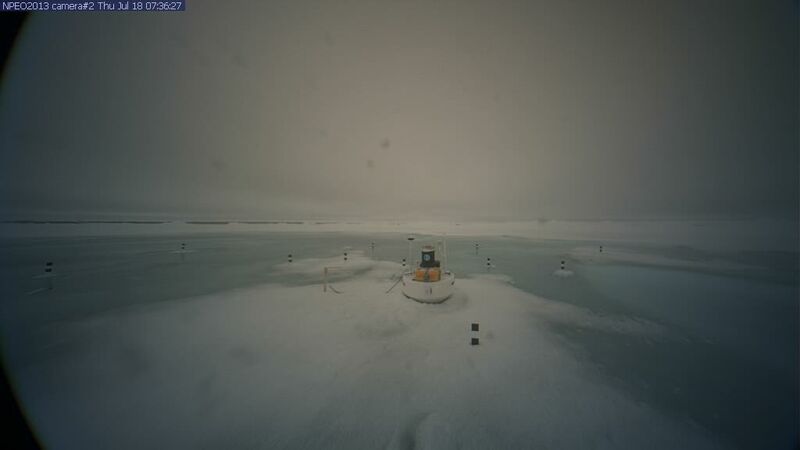 And with so much of this thin ice in areas near the North Pole, a possibility exists that much of this region will melt out over the next 6 weeks or so. As for the Ice Cams? It appears that #1 may soon join #2 in the drink.